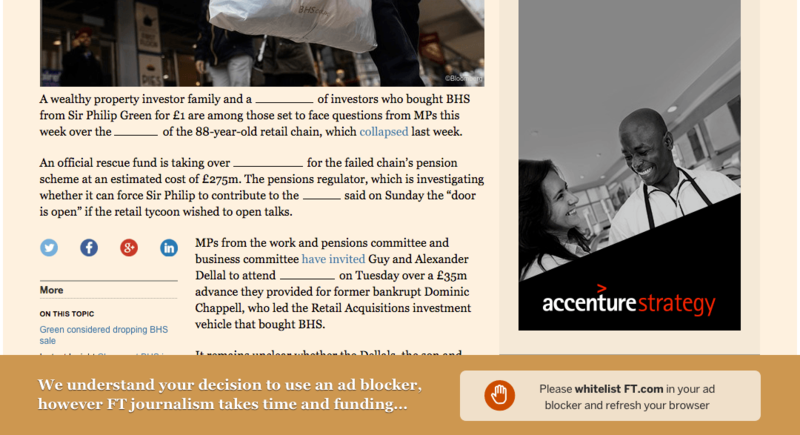 Fighting against ad blockers, Financial Times (international business newspaper) carried an experiment several months ago. Readers were asked to stop an ad blocker on their website and.. well, many of them agreed to. As noted by the represenative of Financial Times: "Through open dialogue with FT readers we are emphasizing the importance of advertising as a revenue stream for quality, independent journalism"
An unintrusive banner was shown with an appeal to disable an ad blocker. Almost 40% of users added the website to the whitelist. Some words in articles were missing (replaced with blank spaces) and the banner asked users to whitelist. Such option has also resulted in many disabling ad blocker for the website. The access to the whole website was restricted. Here more than a half of audience have whitelisted the website. These were the methods to persuade readers to support the site by watching ads. In all cases (with unobtrusive banner and more 'tangible' restrictions) the number of those who added the site to the list of exceptions is quite high - the audience decided that the content of Financial Times is worth it. A lot of major publishers (Forbes, Wired, The New York Times etc) also ask readers to whitelist their sites. These messages are more polite rather than demanding restrictions, as the latter can simply result in the loss of audience. You have probably encountered such restrictions - polite banners which ask you to turn off the ad blocker or when the access to the website is simply denied. What do you think about it? What approaches to persuade readers do you tolerate? Do you believe that not all websites can demand this? Do you accept such restrictions? Share your opinion in the comment section. We here in Adguard have always relied on volunteering users in translating our products to other languages, and we hope so far it proved rather effective. Now we make yet another step in this direction by making all translations public. With Adguard for Android v3.0 just around the corner, we have some early spoilers for you. Today I am going to talk big about new design, but will also touch upon some new features, as well as new approach to the old ones.